Lurv a la Mode has posted a cover for Shannon K. Butcher's paranormal/urban fantasy novel Burning Alive. Check it out here. 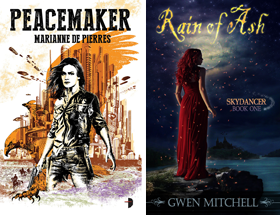 Don't forget to visit Literary Escapism for the March issue of the Escapist Newsletter full of urban fantasy news, interview links, new book releases, cover art and more. Tez Says has cover art for Mark Del Franco’s Skin Deep, a new urban fantasy series coming late July. Suvudu.com has implemented a Free Library with some fabulous titles including T.A. Pratt's first Marla Mason book from his urban fantasy series Blood Engines. NEW YORK, NY - March 4, 2009 - Random House, Inc. today unveiled the first five titles in its new Suvudu Free First Book Library. Designed to introduce new readers to popular and acclaimed science fiction and fantasy series, the Suvudu Free First Book Library allows readers to access free digital copies of the first book in each series.